The iPad's Camera Connection Kit is your gateway to USB audio gratification. It's been rumoured for a while that Apple's iPad might support USB audio interfaces, and this now appears to have been confirmed. Writing on his Analog Industries blog, Audio Damage's Chris Randall says: "There are some caveats, and they need to be paid attention to, but in general it Just Works." 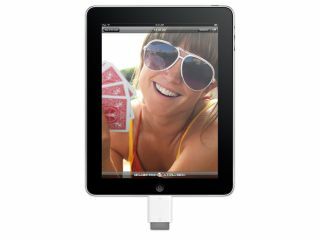 His experiments have shown that interfaces that support the USB 1.0 standard are compatible with the iPad via its Camera Connection Kit. The stipulations are that the interface has to be class-compliant (work without its own drivers under OS X) and require less than 200ma of power (otherwise you'll need an external supply). Furthermore, interfaces will only work with apps that use Apple's CoreAudio API rather than OpenAL, so it'll be a case of sucking and seeing on the software side. Just to confuse things further, Randall also says that Korg's iElectribe - which he thinks must use CoreAudio - crashes on startup when an interface is plugged in, so there are no guarantees here (audio interface support isn't 'official', remember). However the ability to get higher-quality audio out of and - crucially - into the iPad is certainly something that many musicians have been hankering for, so any suggestion that it's possible (as it appears to be) is heartening.